Our Holiday Hydrangea Pre-Lit Teardrop Christmas Swag is for the year-round hydrangea lover. 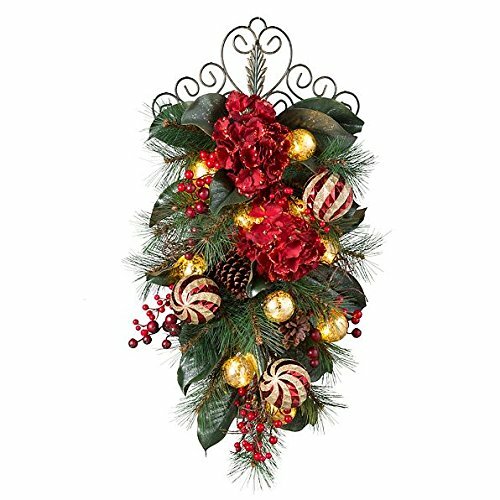 This elegant swag combines deep red, natural-looking hydrangeas edged with gold glitter, PVC pine tips, real pine cones, red berries, twigs, magnolia leaves, and gold and red mercury glass-like ornaments. Gold ornaments light up for a warm, holiday glow. Tear Drop Swag comes with an attached decorative metal hanger. Has a timer function of 6 hrs. on/18 hrs. off. Uses 3 AA batteries, not included. Our Holiday Hydrangea Pre-Lit Teardrop Christmas Swag is for the year-round hydrangea lover. This elegant swag combines deep red, natural-looking hydrangeas edged with gold glitter, PVC pine tips, real pine cones, red berries, twigs, magnolia leaves, and gold and red mercury glass-like ornaments. Gold ornaments light up for a warm, holiday glow. Tear Drop Swag comes with an attached decorative metal hanger. Has a timer function of 6 hrs. on/18 hrs. off.